Located at 1103 West Jackson, Forklift is a farm-to-table restaurant highlighting familiar, local ingredients crafted into unique dishes and served in a modern urban setting. Diners are treated to a view of the curing room, where locally raised pork is transformed into classic charcuterie. On another wall is the cannery, featuring shelves of jars containing the house-preserved pickles, jams, and other ingredients made using local produce chosen at the height of the season. Finally, thirsty patrons will have the opportunity to try a range of craft cocktails, many of them using ingredients from the cannery. Of melons kids hate but strawberries, blackberries and blueberries! We had cocktails, they were great. Cool vibe place w covered patio and indoor seating with huge fans (it got a little chilly sitting right under them). Would love to go back and try the regular menu-if it is half as good as everything we tried, we’ll be regulars! Date night with my wife and two sweet little girls (5&2). They enjoyed it. Chef was able to accommodate our family’s vegetarian needs. Wife enjoyed the cocktails (happy hour 5-7 pm on a saturday!). Great experience. Server knowledgeable about the menu and interactive. Will def do it again! 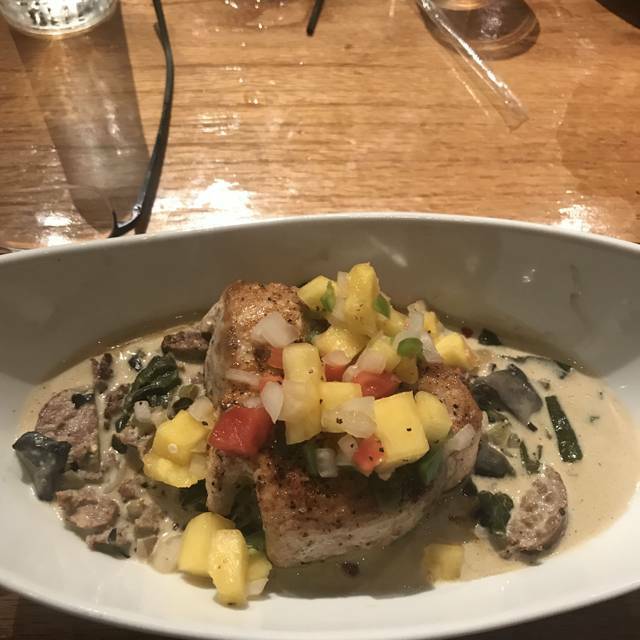 Food was excellent and service was wonderful, enjoyed everything about it and plan on bringing my daughter and son in law for my birthday Sept. 25th. This will be on my list of favorite places to go. I had a reservation for 7, including 5 hungry kids fur at 2:00 on Sunday, 8/12/18. When I got there at 2:00 PM they were closed. The menu had totally changed with higher prices. 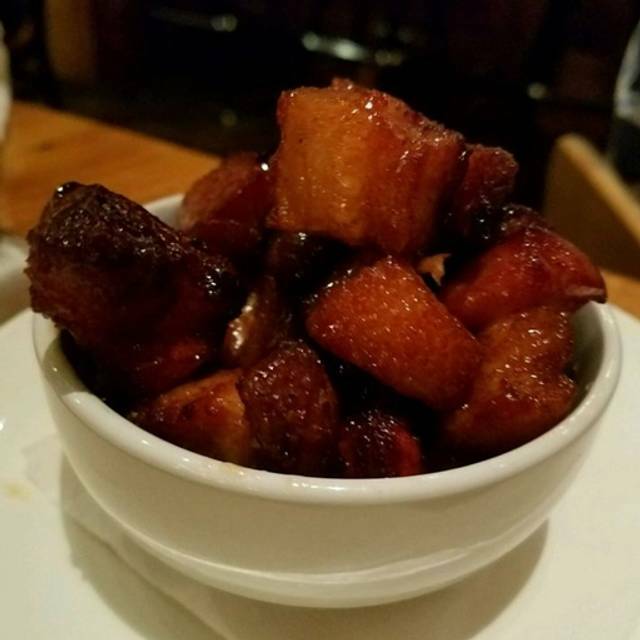 I was disappointed because my favorites were gone and the new menu was good but the sides were not my choices (I am picky) but my friends were pleased with them. 2 of us had the fried chicken breast with glazed carrots which was delicious although the carrots and greens were cold for one of the plates. The 3rd person had the pork chop and she said it was very good. We tried 3 of the desserts, also very good. The reason for the 4 stars instead of 5 was the price of the house wine, $12/glass and I personally felt that the prices were too high. Will go again, just not as often. I really want Forklift to succeed. But it still has a ways to go in my opinion. Service was friendly but extremely slow. I got the smoked chicken pimento mac and cheese. It was good, but not super flavorful. I wasn’t sure what the cut of chicken was. Maybe a boneless thigh? The signature salad was good and I’d order it again. My companion got the pork chop and enjoyed it. I was a little put off by the cabbage with it. He got the wedge salad and breadsticks and enjoyed them both. I was disappointed there’s no longer a burger to default to if you are not loving the menu items. (Their fries were so good!) Bottom line, for the prices, Forklift isn’t quite up to the level they aspire to. We could have eaten at Snackbar or City Grocery in Oxford for the same money. And those places are both 4 plus stars consistently. Forklift has redeemed itself!! The Sunday brunch is fantastic and Shelby does a great job taking care of you! McCoys bartending is the best in town! I had a ribeye. The steak was so tender you could almost use a fork to cut it. The bacon cornbread is outstanding. One of my favorite places to eat. Would advise making reservations. Food was very good and staff was friendly and attentive. Good choices on the menu with variety of good dishes. Bread pudding desert very yummy!!! The whole experience of dining at Forklift wasn’t very good. I had a reservation for 6pm on a Friday, we got there and the place was not busy. We got seated and then had to wait at least 15 minutes before our server paid us any attention. For me the service was just abysmal, constantly having to flag down our server to even get some attention. Drinks seemed to take a long time to come out, food took even longer. My girlfriend had order the salmon which was delicious, I ordered the steak which was absolutely not good. Not sure if the cut was bad or what, but it just wasn’t good. Overall my dining experience was not good, and for the money spent I was highly disappointed. Have only eaten there twice and both times had the steak burger and fries. BEST BURGER AND FRIES ON THE PLANET! Had the Beef Wellington. Perfection. Live music too! Fantastic food, drinks and ambiance. 5 stars!! We had a group of 10. The appetizers we tried, cornbread, bruschetta and grit bites, were all very good. The entrees were another story. Four had steak, and each felt it was served cold. The chicken came without the sauce. The waiter was scarce for most of the evening and had to be flagged down for drinks. He forgot several requests. It may have been just a "bad night" for the cooks and servers. There was live entertainment that was very good, but it was very difficult to talk. If I return, I will stick to drinks and appetizers. Food was okay. We had a party of 9. My shrimp and grits were cold and the hamburgers and steak were over cooked. Server was nice and beer was cold. Celebrating my wife's birthday. This was an over the top experience. We had the Wellington. The filet was excellent. The best we have eaten. The wait staff was excellent. She took very good care of us . We want to return for the brunch on a Sunday...the menu looks awesome. Thank-You for a great birthday celebration. The charcuterie board and smoked southern drink- top notch! Delicious! Very kind staff too! Extremely accommodating general manager and chef, willing to make several different vegetarian dishes based on dietary restrictions. Hands down, the best spicy margarita I've ever had -kudos to the bartender! First time to dine at the Forklift - we enjoyed our meal. Different options than many other places - which was really nice. We will return. You can spend a little money or a lot of money, depending on your order. All of the staff were very friendly. Hamburger way over cooked and the bun was really tuff. Fabulous daily special and friendly service! We will certainly be returning. Our dinner was prepared as requested (steak), the salad was great and our server was attentive! Just not as good as in the past. Most items were over cooked. Service was great. Need a menu make over before we go back. Only complaint is that the music seemed to be too loud for brunch, and maybe it was just set at the saturday evening level, but it made it difficult to converse. Overall good place. Nothing really blows you away but just a good atmosphere with good food. Staff is friendly,decor is nice,service is really good. Would recommend going if you want nice casual dining. Thank you Forklife for accommodating my surprise birthday party for my boyfriend. The private room in the coffee shop was the perfect size and offered a lot of privacy. Our waitress, Ms. Amy was more than we could have asked for. We had a newborn with us and she even held the baby for us. The service we received was exceptional. Our only gripe was that our food took over an hour to come out, which turned out to to be okay since we were there with a group of friends and got to visit longer. Every staff member we encountered was the epitome of what great service should be- friendly, helpful, and hospitable. The drinks were tasty and the food was great. Expensive for the amount of food you receive. I wasn’t too impressed with the food overall for the price you pay. We've been here several times with mixed experiences. Larger groups seem to pose the most inconsistencies. Out of 6 of us, 5 had dishes that were bordering on cold. Food was tasty but temperature took all the enjoyment out of the meal. Staff is consistently great and the patio is a nice experience. All of the above being said, I'd still return for another shot at a better experience! As always, Forklift was another wonderful experience. Their interpretations on food, using locally sourced items, is new, fun, delicious & enjoyable. I lived in Europe for 30 years. One of my comfort foods is croque madam, a typical French sandwich. All I will say is that I loved Forklift’s interpretation! Incredible! Forklift’s bloody Marys are perfectly spicy 🌶! The management & staff at Forklift are top notch! Way to go, people! Bradley and the Staff were all great. The food was excellent. We have not taken advantage of this gem since it opened, but that is going to change. Great restaurant for any occasion. As always, the meatloaf is yum! Thanks for the great service and personal attention. Seated immediately, very friendly staff. Our waitress made good suggestions. Will be back! I went there with my boyfriend. The Aranchini was amazing! 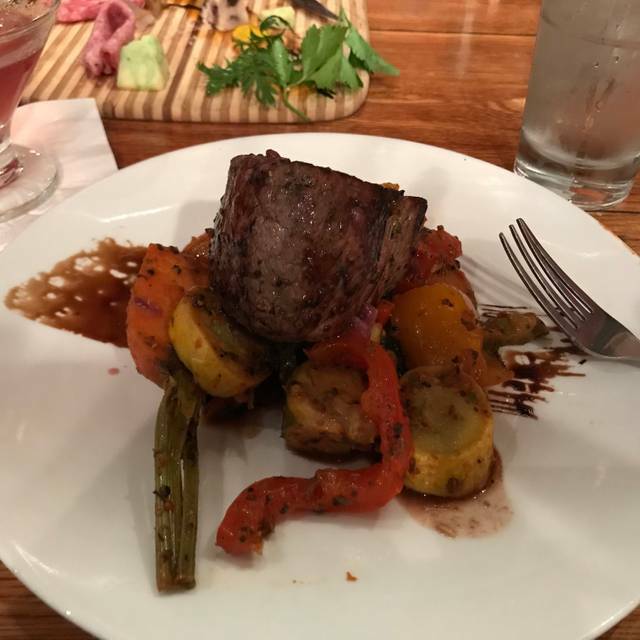 I had a filet, which was cooked how I wanted but had no flavor. The garlic mashed potatoes were good, and the vegetables were a mix between good texture and soggy with pepper on them. My boyfriend's burger was delicious and the fries were really good too. I'll probably come back but next time I won't be getting the filet. I was disappointed in my Tuna as it was overdone, and I didn't realize the vegetables were going to be all peppers. We arrived a little past our reservation time but there were lots of time slots available on Open Table for the rest of the night so we weren’t that concerned. We also called ahead to let them we know we were running late, but no one answered the phone. There was not a table available so we sat outside until one became available. We had to wait a long time before anyone took a drink order. Either the description of the cocktail we ordered was a wrong or they brought the wrong drink. We sent it back and they brought a glass of wine as requested. They did not charge for the wine but did charge for the cocktail which was more expensive. The waiter then told us that they had run out of all steaks, also shrimp and oysters. That left the menu somewhat limited. We ordered a charcuterie tray which was rather expensive for the small portions of mediocre cheese and meats. Our entrees came out at almost the same time as the appetizer. Three of us had the burger which was good, and the home fries and chips were very good as well. Chicken picatta was pretty good as well, but nothing special. The waiter failed to ask if we were interested in dessert, which was just as well, since we were ready to leave. On a positive note, the local beer was unique, and outstanding. All in all, a disappointing visit to a new place for us.